This is the second part of a 3-part series on “indulging” in food. In my last post, I talked about the fact that there is no consensus on what it means to indulge. I gave you two tips for how to think about indulging: First, remember that indulging is not the same as binge eating, and second, avoid overly restrictive definitions of indulging (because a lot of perfectionism and guilt can arise when you define indulging too narrowly). You can read that full post here. 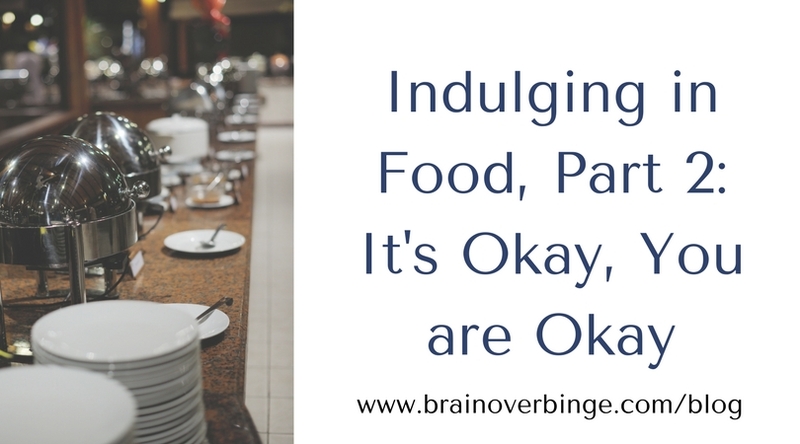 In this post, I’m going talk about what indulging may mean to you personally; and more importantly, I’m going to try to help you see that it is okay to indulge and it does not mean something is wrong with you. I don’t think it’s necessary to come up with an exact definition of what indulging means to you. Eating behaviors can’t always be neatly categorized. Eating is a balance; it can change from day to day, and certainly from person to person; and you get to make it work for you. You may already have your own thoughts about what indulging looks like in your life. Maybe you think about a holiday dinner, or having a meal at your favorite restaurant, or being on vacation and eating a variety of delicious foods you don’t normally eat, or maybe you think of having an extra serving of a food you love when you are already rather full. You may automatically think of eating sugary foods, like having a doughnut or two at the office, or a larger than usual piece of cake at a birthday party. It’s possible you think of healthy foods as well, like eating a big serving of your favorite organic vegetables, or a large, juicy grass-fed steak cooked just the way you like it, or succulent seasonal fruits that you love. As long as you know indulging is not the same as a binge, and is not defined as “any time you eat imperfectly,” that gives you a wide range from which you can view indulgent eating. If you were to check the dictionary, the definitions of “indulge” are varied. Here are just a few: to allow oneself to enjoy the pleasure of….to yield to an inclination or desire…to satisfy or gratify. Using only the textbook definitions, you could theoretically indulge in any eating opportunity, because you could think of it being more about the experience of pleasure and satisfaction than the amount or type of food. During any normal meal or even a small snack, you can certainly allow yourself to take pleasure in it, and you can feel satisfied and gratified. Eating is pleasurable and food should be enjoyed. However, when leaders in the field of eating disorders say, “it’s okay to indulge sometimes,” they typically mean it’s okay to get more-than-normal satisfaction and gratification from eating. So, in the context of promoting recovery from binge eating, bulimia, anorexia, and EDNOS, indulgence usually refers to eating experiences that are at least a little outside of what you’d consider normal food pleasure. And, that’s the general standard I’m using when talking about “indulging” in this blog series. If you want to explore what indulging means to you personally, take a look at what you believe normal eating is for you (and if you aren’t eating normally yet, look for examples in other people who you consider to be normal eaters); and then, if you decide to take more pleasure in food than that baseline of “normal,” that’s what you can see as indulging. If “normal” is enjoying most meals and snacks, experiencing pleasure in eating reasonable amounts (of both healthy foods and some unhealthy foods as well); then indulging could be thought of as enjoying too much of certain foods that are either healthy or unhealthy…but you’ll probably be more likely to think it’s indulgence when the foods are unhealthy. For example, you might eat one average-sized scoop of ice cream for dessert sometimes and you consider that normal eating pleasure, so indulging might be having a two-scoop serving with toppings, which leaves you a little too full. Normal food pleasure might be going to a restaurant and enjoying every bite of your favorite meal, and indulging might be having an appetizer and wine before the meal, still enjoying your meal, and possibly even having dessert afterward. I realize words like “too much” or “normal,” and even “healthy” and “unhealthy” are open to interpretation, but that’s okay, because how we eat and how we indulge in food is highly individual, and having the freedom to decide what it means to you is empowering. But, why does any of this matter to binge eating recovery? Because I want you to take the advice that “it’s okay to indulge” to heart. I want you to believe it, and to believe it requires understanding it. I want you to know that quitting the binge eating habit never means quitting the pleasure of eating, and it also doesn’t mean giving up indulging in food. If you think it does, it makes recovery seem much more difficult, because it requires you to live up to unrealistic standards and it fosters a rigid mindset around food. From a purely nutritional perspective, is indulging an ideal form of eating? Probably not. Is indulging optimally healthy when we look at it only from a physiological standpoint? Again, probably not, because even if you are indulging in healthy foods, too much of anything usually isn’t nutritionally ideal. But might indulging sometimes be good for your mental health and stress level, and benefit you more overall than always having tight control over your portions and the types of foods you allow yourself? Absolutely, especially if you are learning to overcome a “dieting” mindset. Not only is it okay to indulge, YOU are okay if you indulge. Indulging in food is not a sign that you are off-track in recovery from binge eating. Because binge eating activates a more-than-normal pleasure process in your primitive brain, and gives you a temporary reward, in some ways it may seem similar to indulging. So when you are trying to quit binge eating and you find yourself indulging, your inclination may be to think that you are not okay, and that indulging is just another sign that something is wrong with you, and you will never be normal around food. That is not the case. Another benefit of believing it’s okay to indulge and you are okay when you indulge is that it helps cement the fact that you are not restrictively dieting. It helps your body realize you are going to feed it and food pleasure is allowed. This can reduce the binge urges that are rooted in the survival drives, which are activated by deprivation. Like I mentioned at the end of the last post, I’m not saying indulging too much is a good thing; I’m not saying you should never try to curb indulgence if it’s causing a problem for you (which I’ll talk about in the next post). But, I am saying that when you do indulge, it’s very helpful to avoid self-criticism and avoid thinking you are flawed and broken, and instead remember that it’s okay and you are okay.